Let's get this out of the way... I am a Denver Broncos fan. My home and office are decorated 365 days a year with Broncos memorabilia. A good portion of my closet is filled with Broncos-related attire. Even though Mile High Stadium is now exactly 900 miles away from my front door, I still scream at the TV during games, hoping the coach and players can hear me make calls. I get weepy when they win...and when they lose. 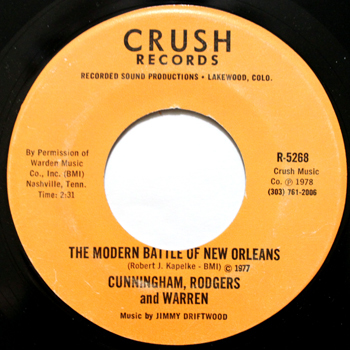 Needless to say, I couldn't have a blog, dedicated to Colorado vinyl, without featuring those records singing the praises of the Orange Crush. While there have been numerous musical dedications to the team, including Joe Walsh's "Rocky Mountain Elway," John Parr re-released "St. Elmo's Fire" (dedicated to Tim Tebow - "Tim Tebow's Fire"), and that incredibly catchy "Black and Yellow" remix last year, "Blue and Orange" (I still can't get that one out of my head), since this blog is about vinyl, I'll stick with that format. In 1977 the Broncos were headed to their first Super Bowl. To commemorate the mile high accomplishment, the city's creative types decided to celebrate in song. 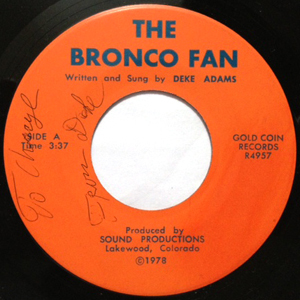 The Gold Coin label featured the Broncos tribute, "The Bronco Fan," performed by Deke Adams. I've listened to this song several times, and I swear he's saying "Orange CRUNCH." In probably an obvious use of available melodies, the local trio of Cunningham, Rodgers and Warren borrowed from a popular Johnny Horton ditty to record "The Modern Battle of New Orleans." Also quick to seize on the moment, Tony Mandarin (Bill Michaels) and the Mile High Rockers released the orange vinyl (also available in blue vinyl) double-sided rockabilly tribute to the team "Bronco Rock," and "Mile High Rock." 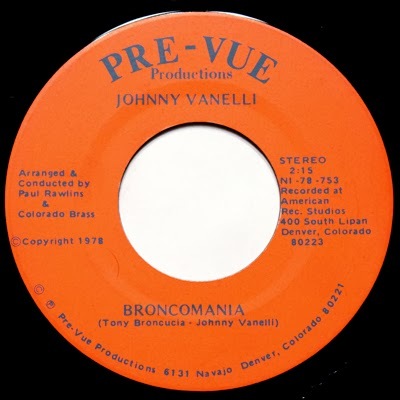 Local lounge singer Johnny Vanelli added a disco entry to the mix, with his "Broncomania" single, backed by the Colorado Brass. While eventually losing to the Dallas Cowboys, on January 15, 1978, Denver continued to celebrate the AFC Champs with the release of The Year of the Broncos, a recap of highlights from the season, courtesy of KOA Radio. 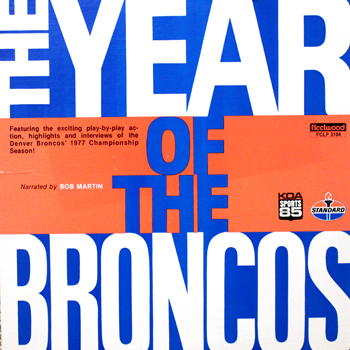 Probably the most notable of the Denver Broncos-related songs came via running back Jon Keyworth. In 1977 he released the uplifting "Make Those Miracles Happen" (Cartay 323232--in case you didn't know, his jersey number was 32). 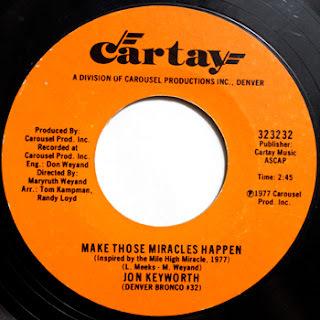 Listen to a sample of "Make Those Miracles Happen." 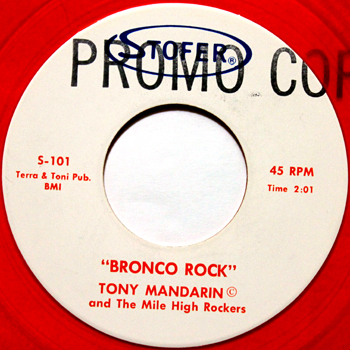 The following year he would release the LP Keys (Aspen label), which would go on to be remembered, not for its songs, but for use of the naked backsides of (reportedly) the Broncos players on the inside of the cover. 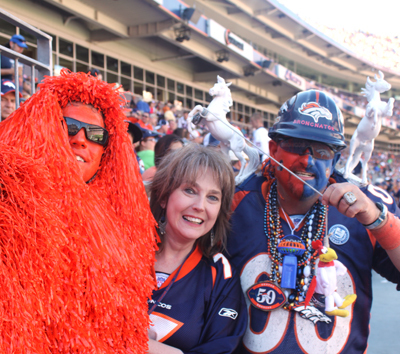 In 1983 the Broncos went 9-7, and finished 3rd in the AFC West. Sensing the despair (and anger) among fans, KBPI jock Don ("The Hawk") Hawkins penned "Prayer for a Fan."